The ultimate guide to creative on-location natural light dog photography. Fetching Photos is the ultimate guide to creative on-location natural light dog photography. Written by internationally renowned professional pet photographer Charlotte Reeves, this 97 page e-book is filled with beautiful full colour example photos, helpful advice, handy techniques and personal stories, and is guaranteed to inspire and instruct! Fetching Photos is priced at AUD $69. For the ultimate resource with insider tips and tricks from a working professional on this specialised niche of natural light pet photography, you’ll agree this is an amazing price! Want to learn the secrets to taking photos like these? Who is Fetching Photos for? Dog photography can be a really fun and rewarding interest, whatever level you’re at! There is much to learn about communicating and interacting with dogs, technical considerations and shooting techniques for those just starting out. As long as you have a digital SLR and a basic knowledge of photography, there will be something in Fetching Photos for you. Whether you’ve just started a brand new pet photography business or have an existing business you want to take to the next level, Fetching Photos is an absolute must-read for you! Learn step-by-step how successful pros get the amazing shots that make clients go ‘wow!’ – which in turn leads to more exposure, a better reputation and best of all, higher sales. If you’re a professional photographer who is considering adding pet photography to your services, the topics I’ve covered in this book will be invaluable. Photographing people is very different to obtaining great shots of our canine friends. Learn how to work with your doggy subjects on a level they understand while adding value and professionalism to your existing portrait photography offerings. Fetching Photos can be used as a total workflow solution, guiding you from shooting a dog photography session from start to finish, or you can pick and choose pieces of advice, stories and knowledge to fit in with your existing experiences and skills. Peek inside and get $10 off! Receive the FREE chapter – “Chapter 9 – Black dog, white dog”. This is one of the best chapters in the book and covers special considerations when shooting difficult subjects such as black dogs or white dogs, or even black and white dogs! Success! Now check your email for a link to download the free chapter and get $10 off the purchase price. Looks like you've already downloaded the free chapter of Fetching Photos! If you'd like to go ahead and purchase, make sure you use the discount code tailwags to get $10 off the purchase price. Bought it right when it came out. Everything is covered, easy to understand for us beginners. I like all photos that accompany each chapter, I haven't read it all yet but I like how easy to understand is everything ... some of us are aspired photographers and we would like to take our photos to the next level. Especially when what we do helps save animals in shelters. Thank You Charlotte I love what I do for the rescue and your book is going to get me in a direction I am after. 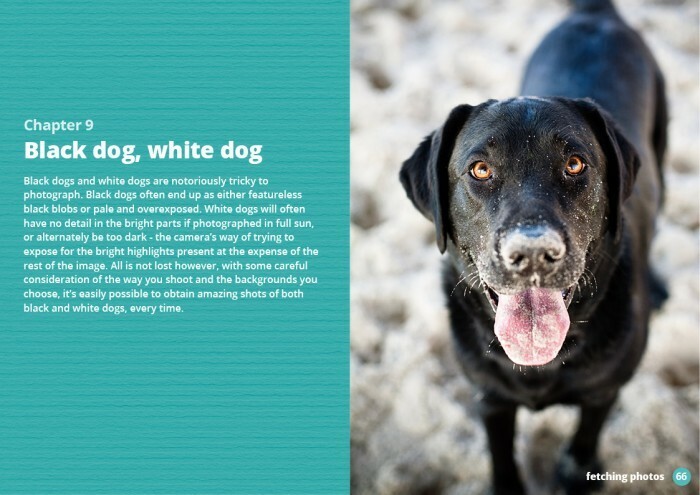 The Fetching Photos ebook is definitely a great read for those interested in creating original, high quality dog photos but it is also an excellent reference for those times when you just need to grab some tips on things like backlighting or exposure modes. We feel Charlotte has been very generous with her knowledge and personal experiences to create the ultimate dog photography reference. Handy hints and inspirational ideas for constantly improving your skills, being the best you can be and finding your style! LOVE IT! The language is so easy to understand and it covers pretty much everything you would need to know. Love that there is a section for rescue dogs too. The e-book itself blows my mind. Not only is it beautiful, but it has more information than I thought possible... info about working with dogs, gear and equipment, how to plan a session, how to choose a location, how to photograph the tricky black or white dog. So much brilliant info, I just got bit by the inspiration bug and want to get out there and photograph every dog I can. I'm an established pet photographer, is there anything in here I don't already know? In my experience, all photographers work differently and have their own little tips, techniques and methods of obtaining the best shots. Especially pet photographers! Even if you’re already well versed in pet photography and run a succesful business, there is always more to learn, different ways of doing things and new ways of seeing the world and your canine subjects. Personally, I relish the opportunity to talk with, interact with and learn from other pet photographers and in reading this e-book, it’s almost like having a conversation with a peer! How will this help my pet photography business? Will it help me make more money? Creating amazing photos of dogs is super challenging and definitely not easy. Although most clients will be happy that you’ve managed to capture their precious canine family member in focus, with perfect exposure and in a happy or fun pose, they will be absolutely ecstatic if you also manage to create something truly mindblowing with amazing light and a fantastic location to boot! Fetching Photos will give you stacks of new ideas and essential knowledge to aid in you creating amazing shots that will totally WOW your clients and evoke an emotional response. And we all know that tapping into this wow factor really assists in getting your clients to spend big and importantly, rave about your amazing skills to their friends – which are all potential clients themselves! Along with good business practices, obtaining stunning images is the key to creating saleable, desirable images and memorable experiences for your clients. Will this e-book be helpful to me? I'm only just starting out! Definitely! Regardless of your existing expertise about photography, Fetching Photos will have lots of information to start you on your dog photography journey. It’s not all technical mumbo-jumbo, and even if there are terms and ideas mentioned you are not sure about, this will give you an idea of what you need to learn before moving onto the more advanced techniques. You can always keep Fetching Photos as a reference to refer to later when you’re more confident about the advanced concepts and then it will be like a brand new guide for you! What format is Fetching Photos in? Fetching Photos comes as an 18mb downloadable PDF file. After downloading on a computer, you can transfer it to your mobile device and read it in Adobe Acrobat Reader or any PDF viewing app you have installed. I have another question you haven't answered here, can you help? Definitely! Please email me your query and I’ll do my best to help you out. Need more? Check out the included bonus chapters! As pet photographers, it can be easy to neglect our own dogs in favour of shooting other people's pets to keep the bills paid. In this chapter, I share my own experiences with photographing my Great Danes - Kaya and Luna - and how regularly photographing them has taught me many valuable lessons.I inspire you to create a personal project to allow you to obtain amazing, memorable shots of your own dogs and embark on fun personal projects, regardless if your dog is photogenic or in the case of my dog Luna, completely un-photogenic! Regularly taking photos of adoptable dogs at a shelter helped to both improve my skills quickly and effectively, and help out a shelter in desperate need of professional photos of their dogs. In this chapter, I share helpful tips and techniques for obtaining appealing images of dogs in shelters, often a very distracting and difficult environment to shoot in! I share my best quick and straightforward methods of obtaining beautiful images of adoptable dogs, which have been proven to help find them a loving forever home more quickly. I was thrilled when Charlotte Reeves announced she was writing an e-book teaching dog photography. Charlotte consistently produces beautiful images and has earned a reputation as one of the best contemporary dog photographers. As a person who shares Charlotte's belief that every dog deserves great photos, I am ecstatic that she wrote a book that shares her immense knowledge base to help photographers (serious amateurs and pros alike) to achieve better dog photography. Ten chapters cover a wide range of topics and I think almost every photographer can take something valuable away from Fetching Photos. Dogs grace our lives for such a short time, that capturing high quality, professional photos is now a must-do for any pet owner. However taking professional quality pet photos can seem like a daunting task - where do you start? The answer is Fetching Photos by Charlotte Reeves. Fetching Photos is the go-to guide for amateur and seasoned photographers alike, wanting to create original, high quality pet photos. Filled to the brim with technical lessons, professional photo shoot planning, and tips on working with dogs, Charlotte Reeves has drawn on her years of experience as a professional pet photographer to create the ultimate resource in dog photography. It's a must for any dog loving shutterbug. Have you checked out my second e-book, Dog Shots – a compendium of ideas, tips and tricks for dynamic and creative natural light dog photography? Give your dog photography a massive boost and purchase them both! Buy Fetching Photos and Dog Shots together and save AUD$29! My name is Charlotte Reeves and I started my pet photography business – Charlotte Reeves Photography – in mid 2007. After 9 years of being in business, I’ve built up my skills and business model to be the successful, internationally renowned pet photographer I am today. I have a steady stream of clients and am at the stage in my career where I get a real kick out of teaching people to discover their potential within a niche area of photography that I personally love and feel has real value to society. When not hanging out with my Australian Shepherds Fletcher & Opal, I love to read, explore new destinations through travel, immerse myself in nature and the countryside, and get physical outdoors with dirt biking, archery and bushwalking. A self-confessed techno geek, I also thrive on finding time to disconnect from technology and spend time with my amazing husband, friends and family. Whatever stage you're at in your journey towards better dog photography, I guarantee there will be something in Fetching Photos that will help you on your way and assist you in capturing amazing photos of our canine friends. Due to the electronic format of this e-book, all purchases are final and there are no refunds or returns offered. If you have feedback for me, please get in touch. It’s your responsibility to save and back up your e-book securely. I recommend saving it somewhere memorable and permanent in multiple places (make at least two copies) as soon as you download it, so it doesn’t get accidentally lost or deleted. Interested in selling this e-book through your website? I have an affilliate program! Contact me to learn more. Did you get your free chapter?